"Located on the coolest street in America this Architectural masterpiece is an entertainment showplace. Light and bright with high ceilings and expansive volume with hip industrial touches, top of the line finishes and extensive use of natural stone and wood elements. The entry level highlights a massive chef's kitchen with dining area and walls of glass opening to a living wall and bubbling spa. The step down living room showcases lush atrium-like views and a stunning outdoor waterfall. Two addi"
"This rare and exceptional offer is on over 35 feet of Venice sand frontage on prime Ocean Front Walk and is a stunning L. Anthony Greenberg Architectural. A doublewide floor plan with top-of-the-line finishes makes this property the premiere and largest unit at Ocean Front Townhomes. Sensational ocean views of the Pacific, dreamy stretches of sandy beaches, and palm trees lining the Santa Monica Mountains provide an outdoor space that is simply breathtaking. With over 3,500 square feet of living"
"The refined European esthetic & intuitive approach to space of the Hoff-Genoist design team are reflected in this remarkable private oasis with guest house in the heart of Venice. Their unparalleled eye for design is apparent in every detail, from the solid walnut floors to the live-edge bar, architectural staircase, spectacular fixtures, one-of-a-kind built-ins & lush landscaping. Enter through your private courtyard into a refined yet warm living & dining space, to a huge chef's kitchen that i"
"The Broadway House, by Noah Walker, AIA, the visionary behind the Oak Pass House. As featured in Architectural Digest, The Broadway House integrates a 1910 California bungalow w/ a modern day architectural, perfectly blending w/ Abbot Kinney's vision of artistic westside living. Designed to reflect its natural surroundings, this 4 bed 4.5 bath layout is ideal for entertaining & sophisticated living. Soaring ceilings & an abundance of natural sunlight create a bright interior accented by sleek li"
"Custom beach architecture for a modern lifestyle, in the heart of Venice! Completed in 2019. Almost 4500sf of designer done interior w/grand open entertaining spaces, stunning wood clad volume ceilings, a spacious cooks kitchen w/Miele appliances, island w/seating & separate pantry. Also on the 1st floor you have a guest suite w/separate entrance. On the 2nd floor, there's 2 bedroom suites and an exquisite master retreat including a spa-like bath, private balcony & large closet. Level 3 is the l"
"Island location on the Venice Canals. Truly a once-in-a-generation property, this elegant 3-story Tuscan-style home is among the largest & most coveted homes in the Venice Canals enclave. Built & maintained with attention to detail, this home, designed by architect Louis Tomaro, features spacious rooms, balconies, high ceilings & designer touches throughout. Gourmet eat-in kitchen w/butler's pantry and Viking & Sub-Zero professional appliances. Oversized living room with 12-foot ceilings opening"
"Duplex! Remarkable cutting edge Modern/Beach Property setting the highest standards with no expense spared, this Modern House is currently one of the best offerings in all of Venice Beach. With approx. 4,518 sqft of living space, 5 bedrooms and 4 baths, an open floor plan designed for entertaining that seamlessly intergrates the beach vibes with a full roof top patio with views on views on views! This home offers the feeling of privacy and space that you will not find anywhere else. The master b"
"Stunning views await you in this beautiful new home located on the coveted Venice canals. Enter into a timeless open floor plan that has exposed reclaimed wood beams that adorn the entire downstairs ceilings. The gourmet kitchen is well appointed with high-end appliances included a Wolf double oven, 6 burner stove, and a built-in wine cooler that will make all chefs' feel welcome. Accordion iron sliders open to the canal to create acomplete indoor/outdoor experience from the living area to the p"
"33 20th Avenue defines modern luxury. 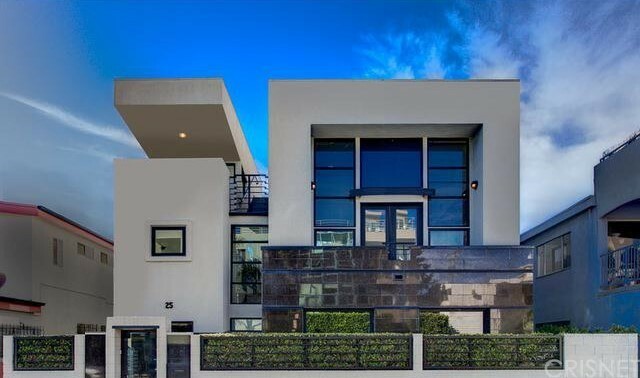 Silicon Beach 3 bedroom 4 bathroom architectural masterpiece designed by William Adams with SMART home technology is located on a desirable Venice walk street and just a stone's throw to the sand. The home has a stylishly open floor plan featuring soaring ceilings and over sized windows letting in natural light and ocean breezes. A sleek and sophisticated gourmet kitchen with Miele appliances and Bulthaup cabinets awaits. The expansive master suite leads to "
"One of Venice's most charming Craftsman compounds. A half block to the beach on a beautiful walk street, this rare 1908 property exudes character and elegance. A meticulously restored 4 bed/3.5 bath main house, 1 bed/1 bath guest house & studio apartment provide flexibility to either live in as a owner-user or rent out part/all of the units. A gate & maturely landscaped front yard with hibiscus & lemon trees welcome you to an inviting porch & grand foyer. A generous living room opens to a sunroo"
"First time on the market in over 50 years! Extremely rare, single-family residential zoned property in one of the most coveted pockets of Venice. This 13,678 square foot corner lot is primed for a developer or owner-user to completely re-imagine the site. Just blocks away from trendy shopping and dining on Abbot Kinney Blvd, 1 mile from the beach. 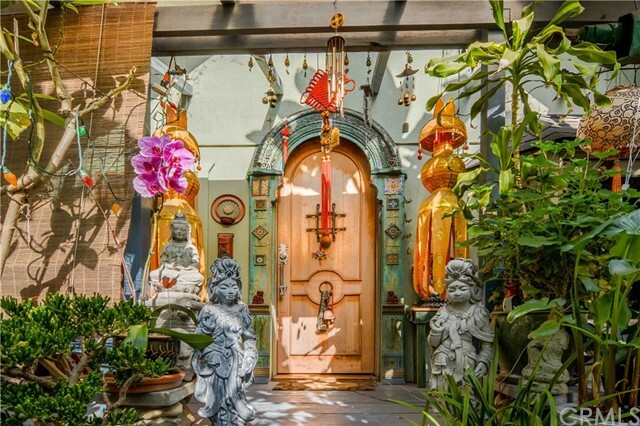 Located directly across the street from world renowned architect's residential/arts compound... This is a once in a lifetime opportunity. Property is "
"Incomparable brand new modern home just completed in Venice! Smart home features throughout, this property is the ideal lifestyle for the Silicon Beach buyer. Boasting over 3600 sqft, the house includes 4 bedrooms 3.5 baths designed for indoor/outdoor living and entertaining. Just 5 minutes away from Abbot Kinney and Venice beachfront, enjoy all the exciting lifestyle Venice has to offer! First floor enters to a spacious in-Law Suite complete with a walk in closet and private bathroom. This coul"
"2 separate homes on 1 lot! This charming 3-story Venetian original features gorgeous restored hardwood floors, leaded & stained glass windows & original period features throughout.Step into the elegant foyer & your eye is immediately drawn to all of the beautiful architectural details that make this home unlike any other. Feel the character & warmth flow seamlessly from the spacious dining room into the kitchen.The adjacent living room is highlighted by a sunroom w/a marble floor, a remarkable &"
"Stunning modern awaits in this beautiful home on one of Venice's most coveted Walk Streets. Soft ocean breezes carry you through the tranquil and enchanting garden that greets you with Zenful vibes and are carried throughout this home. Floor-to-ceiling stacking windows allow this open floor plan to be filled with an abundance of natural light that invites indoor-outdoor living. Gourmet chefs will feel at home in the well-designed kitchen with the finest Viking and Subzero stainless steel applian"
"Rare opportunity to own this beautiful 1912 Venice craftsman. No expense spared on the restoration of this iconic home. Restored from the foundation up, this home features the luxury of Wolf appliances, Carrera marble, imported Moroccan tile and high end fixtures throughout, while perfectly balanced with all of the original built-in wood work of the era. Gorgeous Acacia Walnut hardwood floors. Arguably, this home has one of the largest wrap around front porches in Venice, ideal for entertaining "
"Designed by Robert Thibodeau of DU Architects, this stunning home located along Grand Blvd's Architectural Row in Venice is a true delight. Encompassing gorgeous design elements throughout, you'll love entertaining in the warm open floor plan featuring polished concrete floors, glass walls, and soaring redwood ceilings. The gourmet kitchen is a chef's dream with custom cabinetry, high-end appliances, integrated Caesarstone countertops, and beautiful Anne Sacks glass tiling detail. Two spacious g"
"This Venice Canal charmer has a classic Venetian vibe befitting its location. This light and bright home features an open floor plan with high ceilings, updated kitchen, 2 generous sized bedrooms, bonus room/office, 2.5 baths, rooftop deck and private permitted dock! Just step through the double doors and you will fall in love with all that the historic Venice Canals have to offer. Take a sunset stroll or simply dine al fresco on the garden patio. Don't forget to check out the second floor where"
"This stunning remodeled Craftsman is located on one of the most charming streets in Venice. The amazing location is in close proximity to the sand and near the hippest restaurants & shops of Abbott Kinney. California living personified, with an open floor plan expansive Living Room, Family Room, and Dining area. Gourmet Chef's Kitchen with top of the line stainless steel appliances, custom cabinets, designer finishes, and large walk-in pantry. Flooded w/natural light, this two-story home has 2 b"
"Thoughtful details sprawl throughout 3,100 sq ft of this Architectural new construction. The open concept living area, which is perfect for entertaining, sits atop porcelain tile and is warmed by the leather-texture, black granite fireplace. Sleek contemporary cabinetry next to the custom-forged waterfall edged peninsula with Wolf and Subzero appliances highlight the kitchens allure. Control is at your fingertips with a home automation system that remotely connects everything from lighting to te"